A French Bulldog needlepoint ornament by Kirk and Bradley. The dog is holding a candy cane in his jaw with snowflakes in the background. 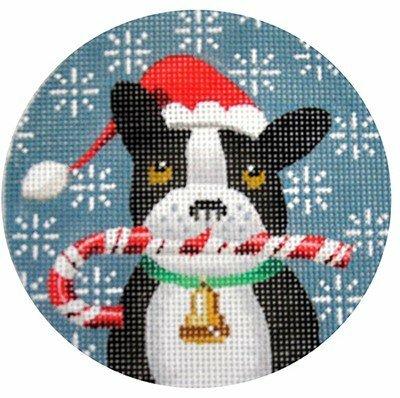 The design area measures 4" in diameter and is a small needlepoint project that can be finished as a hanging ornament or framed. The design is sold canvas-only or with fibers. You can make your selection from the drop-down menu on this page. if you select cotton we will send DMC embroidery floss; wool is Bella Lusso; the silk is Planet Earth Pepperpot silks. This needlepoint ornament canvas usually ships within 1 week. If you are in a hurry please let us know. Contact us if you have any questions about this needlepoint canvas. We're always glad to help.